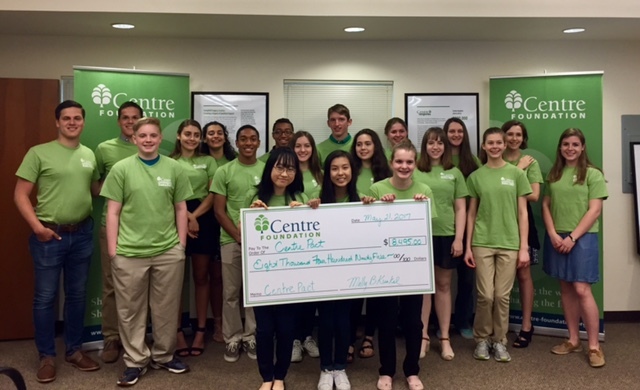 A group of Centre County high school students awarded $8,495 to six local non-profit organizations as the culmination of their year-long participation in Centre PACT (Philanthropic Actions Created by Teens), a program of Centre Foundation. 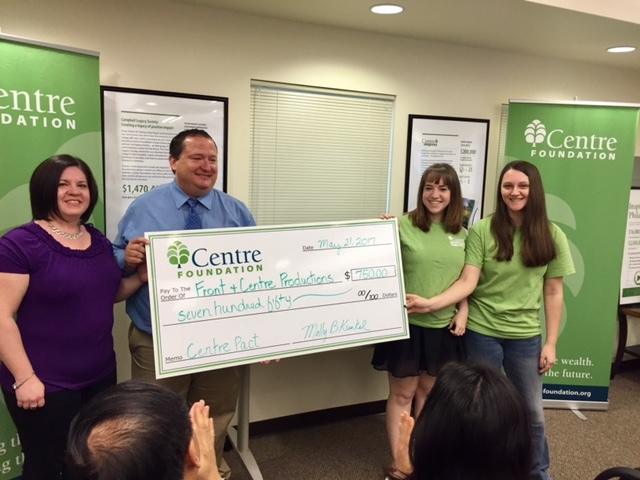 “I am tremendously excited about the impact our funding will make for all the organizations we have chosen to support,” said Aja Kukic-Bartoo, a member of Centre PACT. 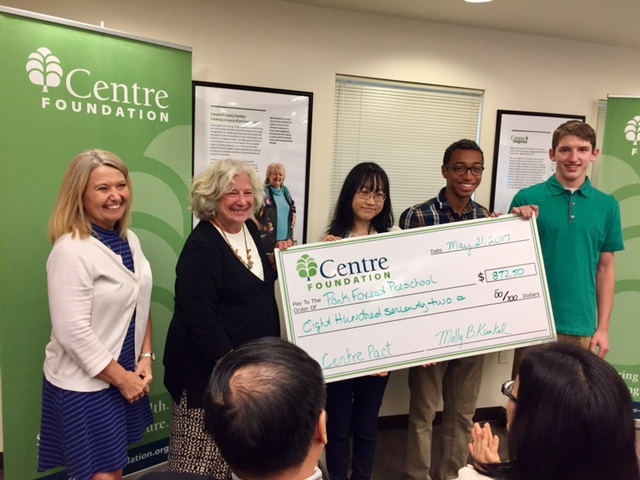 In September, the students kicked-off the program by selecting the theme of “Educating and Inspiring Youth for a Healthier, Brighter Future,” which guided their granting decisions in April. After creating their own grant application process and putting out a request for proposal, the students reviewed the applications. Finalist organizations received a site visit from a cohort of the students so that they could view the program up close, see the impact, and ask the staff questions. “The grant application process and site visits allowed the students to learn more about the nuts and bolts of granting, as well as provided them with a window into how non-profits operate,” explained Kunkel. 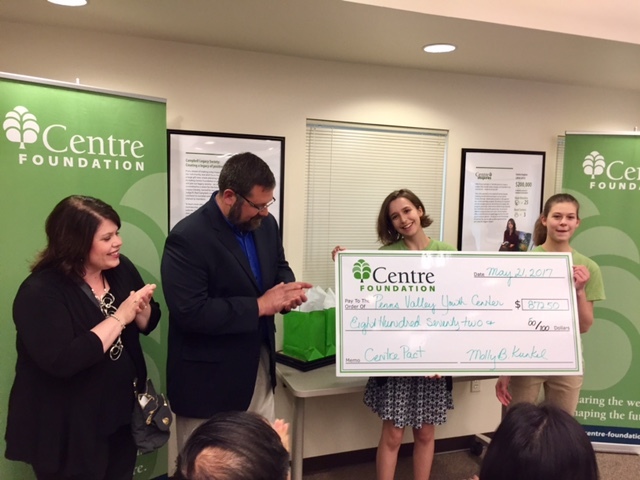 The students began the year with a $1,000 granting pool provided by Centre Foundation and $2,000 from a recently opened endowment fund for their group, but quickly realized their appetite for impact was much larger. So, they began a prospecting campaign that ultimately raised $5,495 from 37 community supporters. “The students’ dedication to expanding their impact was commendable, allowing them to make grants to six organizations,” said Kunkel. Students, parents, community supporters, and non-profit representatives were on hand for a check presentation party, which also marked the end of the program’s second year. Ann Marie Paul and Kukic-Bartoo presented $872.50 to Darren and Anne Narber of Penns Valley Youth Center (PVYC), which serves 6th – 12th grade students in the Penns Valley area. The funding will establish a new Integrative Arts Program, helping students to strengthen their success in and out of the classroom. 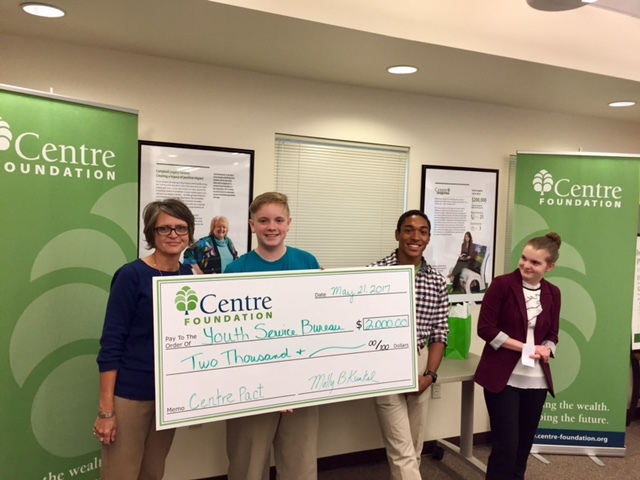 This was the second year that PVYC received a grant from Centre PACT students. 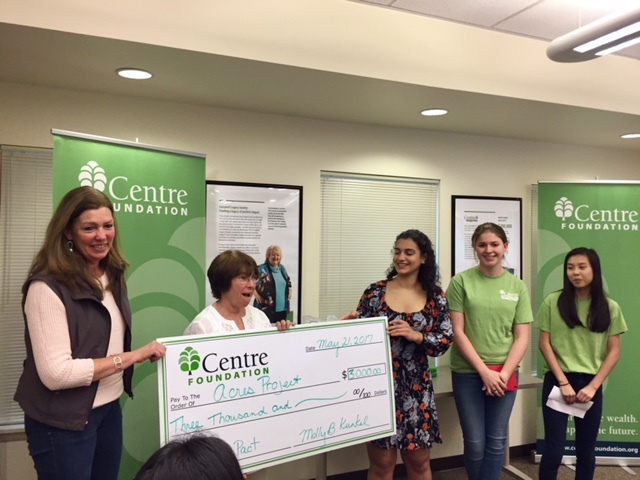 Darren Narber noted his appreciation for the growing relationship with Centre PACT students, whose financial support has positively impacted students attending PVYC. Joey Feffer, Patrick McNutt, and Katherine Kim presented $872.50 to Debbie Lower and Gail Addison-Guss of Park Forest Preschool (PFP) for the Love of Arts program. This grant will provide funding to enhance the music and art programs with more instruments, art easels, and other materials needed for open-ended arts activities. “With this grant, the children at Park Forest Preschool will be painting, dancing, playing instruments, and singing to creatively support the development of the whole child,” said Addison-Guss, board chair of PFP. Bella DiNallo, Brontë Clingham-David, and Grace Handler presented $1,000.00 to Marisa Vicere of the Jana Marie Foundation (JMF), also a second-time recipient of a Centre PACT grant. Nick Feffer, Saoirse Hopp, and Will Wagner Henne presented $2,000.00 to Andrea Fisher of the Youth Service Bureau (YSB) for the Neighborhood Outreach program. “After visiting the Youth Service Bureau site and hearing about all the work they do in the community, I feel very confident in granting this money to their program and believe it will make a very positive impact,” said Jackie Saleeby, reflecting on the students’ site visit to YSB. “Their program to reach out to less privileged children could change their lives so early on,” added Centre PACT student Caroline Sparrow. Fisher commended the students’ efforts, noting that the grant will provide six months of program funding. The Neighborhood Outreach program sends staff into the field to interact with at-risk youth who experience family strife and poverty. The YSB staff members provide healthy snacks, activities, mentoring, homework help, and hope. The final grant of the evening was presented by Sparrow, Saleeby, and Joy Zhu. The students presented a $3,000.00 grant to Bella Bregar and Barb Alpert of the ACRES Project, which provides support for individuals with autism. “After going on a site visit and meeting people involved with ACRES, I am excited to see the impact their after-school activity will have, both in the short-term and long-term,” reflected McNutt. Perfect attendance awards were also presented to Emma Riglin and Joanna Switala, students from the Philipsburg-Osceola School District who travelled to State College for the monthly Centre PACT meetings. Graduating high school seniors included Nick Feffer (Dartmouth, Biology), Joey Feffer (Harvard, Applied Math), Emma Riglin (Pennsylvania State University, Public Relations), and Katherine Kim (Carnegie Mellon University, Biology). Two Class of 2017 – Penn State students who helped found the Centre PACT program and served as collegiate advisors for the past two years were also recognized, Carver and McQuillin Murphy. The Murphys saw the program grow from a concept, to a pilot program with seven students raising $5,000, to this year’s program with 18 students. Centre County high school students may apply to join Centre PACT during fall recruitment, which will begin as schools reopen in August and September. For more information, please visit Centre-Foundation.org or contact Irene Miller, Development & Events Coordinator (814.237.6229 | irene@centre-foundation.org).